Americans have been driving their pickup trucks to the end of the road, and beyond, for more than a century since the Ford Model TT rolled off the assembly line in 1917, followed by the Chevy Model 490 a year later. The Model 490 was available in a chassis-only configuration, opening the cargo box design to a wealth of possibilities we are still experimenting with today. Pickups were rugged, Spartan vehicles until we began to embrace outdoor recreational pursuits in the 1950s. By the 1990s, most pickups were used primarily as passenger cars with a litany of creature-comfort options, which continues to expand exponentially. Our 21st century lifestyle is steadily pushing these vehicles away from their original intended purpose, leaving Americans wondering about how to use them on an adventure where the rubber leaves the road. 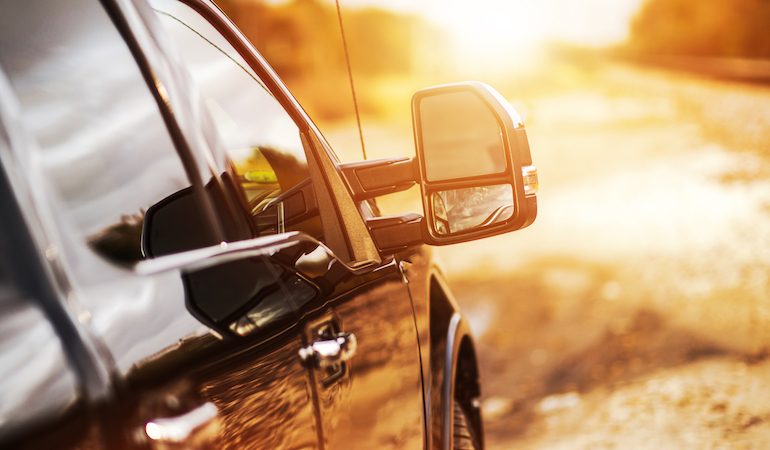 Modern devices like smartphones and GPS can be useless or even counterproductive in the sticks or shore where the only trail is imprints from 10-ply tires, and the reflection in the outside mirrors brings home the epiphany that YOU are 9-1-1. Here are some tips and tricks to pull you out of a pickle without relying on the kindness of strangers. Experience often drives the need to keep specialized gear in your truck at all times. Manufacturers started including spare tires and jacks with vehicles decades ago. A flat spare tire compounds an already bad situation. Checking spare tire pressure and the mechanism, which allows access to the spare, should be a part of any serious pre-adventure check list. Paper maps covering your projected area of travel can also be a welcome relief if your GPS were to ever fail you for some reason. Tool boxes should be standard cargo any time you get behind the wheel. One should be readily accessible with a reasonable selection of hand tools, flashlights, fuses, duct and electric tape, zip ties, paracord, road flares, first aid kit and an emergency power source like the Nautic Sport. Emergency power sources with the dimensions of a large candy bar have been available for about five years, quickly replacing bulkier jumper cables as part of a standard truck kit. These devices also have ports for charging laptops and smartphones to relay the message you are out in the boonies and need assistance. A 105-quart cooler secured in the truck’s box is a great place to stow less frequently used gear like a shovel, saw, hatchet, small air compressor (which can be powered by the Nautic Sport), tire patch kit, come-along, nylon web tow strap, 8x10 plastic tarp and other more obscure items like large garbage bags and a roll of aluminum foil. A cooler is superior to a standard large tool box because it can actually be used as a cooler or for transport of a trophy fish in states where invasive species rules prohibit travel with water in the livewell. Many items in your tool boxes can function far beyond their original intended purpose, with potential utility constrained only by your imagination. Truck travel in the U.S. is limited only by water deeper than the frame, and even this barrier is negotiable in some northern states during winter months where at least a foot of ice exists. Installing a dipstick oil pan heater is a good idea when planning any cold weather adventure in America’s cool, blue North. Tossing traction mats in the truck’s box is a good idea when headed for the beach or those countless adventures between shining seas known as “wetlands” (your truck’s floor mats can also be used in a pinch). Exact “possibles” gear can vary by both region and season. My truck’s box carries three eight-foot sections of 2-inch PVC pipe most of the year, with a primary function of protecting fishing rods on quick forays away from home. One time the pipes had to be duct-taped together to provide a functional ramp for sliding a big buck up into the bed with the aid of a come-along and heavy eye bolt attached to the top front of the cargo box. Experience often drives innovation. For example, there is wisdom in folding in outside truck mirrors when headed through the deep woods where the only exits might be backwards. Eye-of-the-needle truck-backing skills are of little value when reverse-navigating with the driver’s side mirror and the inside of the needle’s other side is a two-inch oak which would have been visible had you only checked the mirror before contact. The cost of replacing a mirror is outrageous. Don’t ask me how I know. Intimate knowledge of your truck’s limitations, capabilities and your own ability are good things to have when the solutions to a problem are more than a couple of finger flicks away on a smartphone that is showing zero bars. Experience also teaches the need for advanced training when your pickup needs to function beyond hauling kids, dogs and groceries. The most obvious use is pulling some kind of trailer. A truck/trailer unit has entirely different characteristics than the passenger transport mission the average truck works at 85 percent of the time. A vacant parking lot is a great place to work on trailering skills, beginning with discovery of the rig’s turning radius. Even parking requires some forethought. Ponder the best approach to a boat ramp prior to discovering the approach should have come from a different vector. Place traffic cones to emulate single-lane boat ramp dimensions and practice backing skills until you’re comfortable your arrival at a boat ramp won’t trigger jeers and ridicule from those gathered at the ramp. Utility trailers usually have shorter tongues and quicker response than boat trailers, resulting in a much better tool for learning backing skills. There are several schools of thought on steering wheel hand placement when backing a trailer. Two universal components in competent trailer backing are turn small and don’t panic. The essential truck items mentioned earlier in this article are often essential in determining tactics that will get you back on the pavement. Items like aluminum foil or large garbage bags may seem strange to someone who has never needed an emergency water bowl for a dog or savored a hot meal of weenies roasted on the manifold after a cold day in the outdoors. A large garbage bag can be used as a quick and functional raincoat and means of retaining body heat besides the obvious purpose of leaving no trace and picking up trash others have left behind. Getting stuck is inevitable if you spend enough time off of the paved or beaten path. The come-along and nylon tow strap can be life savers. If no other vehicle is available, the tow strap can usually be attached to a purchase point like a tree or boulder, using the come-along to free the vehicle. Be sure to keep your body away from a potential cable snap. Several times I’ve encountered sad folks who have backed off the end or edge of a boat ramp, hanging up the frame of their trailer with often expensive consequences. A quick solution is hooking one end of the come-along through the boat’s winch attachment on the bow and securing the other end around the frame. Of course, this means that somebody needs to get wet. You might lend your come-along to a person who has not read this article, and then hand them a garbage bag when they offer their shivering thanks. TOPPER, TONNEAU COVER, OR TOOLBOX? There is much to be said for keeping your cargo out of the environment and away from prying eyes. Garbage bags can be a quick fix in inclement weather if security is not an issue, but for the long term, you need to protect your stuff. If some form of cargo box cover isn’t part of the initial purchase, a topper, tonneau cover or tool box are probably part of your long-term plan. Don’t be in a hurry when choosing this accessory! Drive your new baby for at least a month with the basic naked box. The eventual optimum choice will become increasingly clear every time you retrieve cargo.